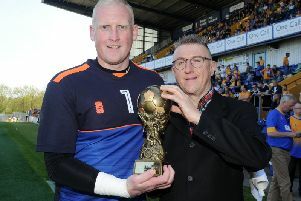 Mansfield Town Football Club is taking massive strides towards being self-sustaining, despite struggling to attract fans through the turnstiles. The club’s annual meeting, held this afternoon, covered two sets of accounts and showed that the club’s loss of £1.1 million from 2013 had been reduced to £721,000 in 2014 and by last year had dropped dramatically to £74,510 for the year ended 2014/15. After several years of reporting losses of over £1m, it was agreed this was a fantastic achievement. There was further good news for the club as it was announced that owner John Radford and directors Steve Hymas and Steve Middleton have all agreed to convert loans totalling around £1.2m into preference shares in the club, wiping more debt off the books. Stags are now hoping to persuade former director and chairman Andy Saunders to do the same with his loan. Owner and chairman John Radford also revealed that the final staged payment for buying One Call Stadium will be paid to landlord and former club owner Keith Haslam this year. “That money has been set aside so there is no problem with that,” he said. “That chapter’s out of our book and put behind us. “The club is getting in better and better shape. “As a chairman, it’s feeling more comfortable running the club. “Everyone is working hard and the club is getting closer and closer to sustaining itself. We are in an excellent place at the moment. Hopefully things will get better and we can push on on the field as well. “But we need to get these loans off the club’s back, so later on myself, Steve Middleton and Steve Hymas are going to transfer well over a million pounds worth of our loans into preference shares in the club. “We still have loan accounts left on the books with Andrew Saunders, who has taken the club to court a couple of times in trying to get his loans back, but not been successful. “Hopefully down the line Andrew will help the club and convert his loan into preference shares. If he wants to convert his I will match his. I want the loans out the books really, we are working on that and I am sure that will eventually happen. He added: “The only issue we have right now is getting people to come back to football, though it’s not just this club that has that problem. “Playing attractive, winning football on the pitch is all we can do. “We were favourites to be relegated before the season started but now people are talking about play-offs if not promotion. “I feel confident if we get into League One we’ll be in a lot better place. “We could be a good club in League One, but my aim is still to get us into the Championship. That’s still there. The club are only allowed to spend 60 per cent of their turnover on players’ wages so are restricted in what they can do. In 2014 turnover increased from £2.4m to £2.6m and overheads were reduced by £2.9m to £2.6m. In last season’s accounts, turnover was down from £2.6m to £2.2m while overheads were slashed from £2.6m to £1.8m, helped by cutting wages from £2m to £1.5m. As far as special offers are concerned to get fans back through the turnstile, operations director Paul Broughton pointed out that the club are only allowed five deals a season by the Football League with only one involving away fans. On the club’s ticketing system and costs, it was explained that getting fans to buy tickets in advance had enabled the club to massively reduce stewards and policing costs with knowing in advance what sort of numbers would be attending. It was also revealed that policing costs for the two games with Chesterfield had been £18,000 per game. Before the meeting began, work finally started on the installation of the former Wembley scoreboard on the Bishop Street side of the ground towards the corner with the North Stand.